Ferramonti Camp was located in a malaria-infested region in the Cosenza province in the region of Calabria across from Sicily. This was the largest of the 15 internment camps established by order of Mussolini between June and September of 1940. In this huge camp, the family was provided a small room just for themselves. There was no comparison between the German and Italian camps; in Italy, families lived together and there was at least a modicum of social welfare. There was no official schooling and, although there was an unofficial school, Alex and Vera didnt participate, feeling that the subject matter was too remedial. Vera spent much of her time with her father and his friends. The camp inmates were some of the top intellects of Europe. 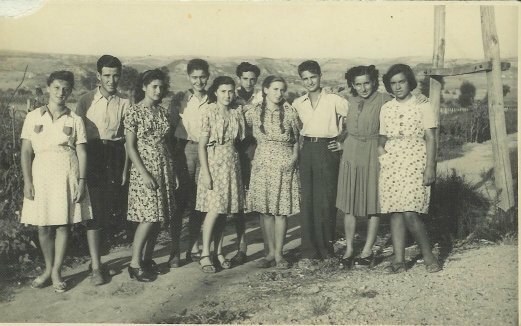 Between June of 1940 and September of 1943, there were 3,823 Jewish internees at Ferramonti. The commandant was assisted by 100 military personnel. Living conditions, at first decent, became increasingly more difficult as the situation of the Jews deteriorated. Even so, Ferramonti was never a concentration camp in the German sense of the term. Four weddings and 21 births took place here and no one was selected for the Polish gas chambers. Relations between internees and authorities were tolerable. Ferramonti was not a work camp; internees could basically do what they wanted. Still, the camp had barbed wire fences. The Red Cross would send packages including medicine, but the Italian doctors would confiscate the goods and sell them on the black market. Although the food was not very good, the Italians would smuggle in better foods like oil and bread. Alexs job for the Italians was to pick up bread outside of the camp for distribution; the Italians would give him the occasional extra loaf. The family was just learning to speak the Italian language. Prisoners were required to give the fascist salute to the camp commander when he passed by, but Adolf would always avoid him for this reason. One day when Vera was with her father, the camp commandant cornered them and said you dont salute me as a man; you honor my uniform! Adolf replied, You as an individual I dont know; its your uniform I despise. The commander stomped away furious. Yet, when Adolf died in August of 1942, the commander came with his two little boys to the funeral and remarked that Adolf was a man that he had respected. As head of the family who was protecting his wife his children, Adolf was under a great deal of stress and lost a lot of weight. One day he was given a typhoid shot (men were given the shot in their chest) and later that day he suffered a heart attack. He hadnt been feeling well all day and was taking a nap when he died. Several doctors tried to help, but there was no medicine to save him. Still, if he had survived, doctors said he would have had no quality of life; this would have truly destroyed him. He was 48 years of age. Under a simple wooden marker, Adolf was buried in the town near where the camp was located (Tarsia). Many years later as an adult, Alex went to visit the site. Families living in the camp could request to go into libero confino (free confinement), which meant that you could go live in a town but were confined to that town with mandatory daily check-in at the local police station. When he was alive, Adolf had refused to ask anything of his captors, so they never petitioned to move. A few months after he died, the camp commandant told the family he wanted to provide Marianne, Alex and Vera with libero confino. They declined the offer, but the commander faked their signature and shipped them out. When they left, Vera, in an effort to emulate her father, said to him, You are my enemy, but you are a decent man and I respect you. The commander saluted her and said it was one of the greatest honors he had ever been given.